I am addicted to couscous. I blame my little sister (aka #4). She’s the one who first introduced me to it, and since then I have come to love it beyond words. It’s hard to even pinpoint what I love most. Maybe it’s the couscous grain itself – so buttery and delicious. Or perhaps it’s the combination of fresh & dried fruits; it does pair my favorite tart dried cherries, cranberries and apricots with the sweetness of fresh melons. Or maybe it’s the nuts? That’s a strong possibility, since toasty roasted pistachios, walnuts & pecans are showcased. Who am I kidding? It’s all of it, tossed together to create a sweet & savory, soft & crunchy perfection you just can’t find in other salads. And the best part is that you can customize it to include any of your personal favorites. My little sister loves to add pomegranate seeds. I adore it with the fresh melon and dried papaya. Any way you choose to make it, be forewarned – once you try it, you may never stop obsessing over it. Trust me. In a saucepan, combine the water, salt, agave, cinnamon and butter; stir over medium-high heat until the water mixture comes to a boil. Quickly add the couscous and stir constantly for one minute, to prevent the couscous from sticking. Cover tightly with a lid, turn off the heat, and let it sit for 5 minutes. While the couscous is resting, chop your fruits and nuts into roughly the same size pieces and place them in a large mixing bowl; toss with the juice and zest of one orange. 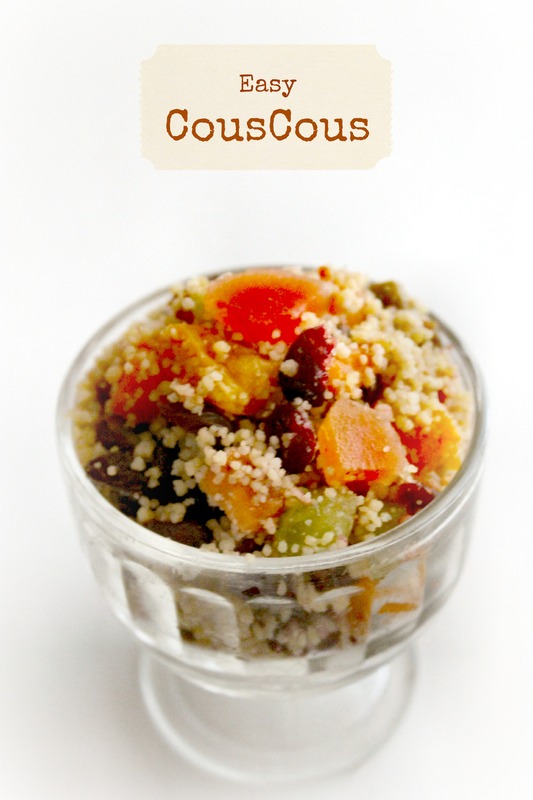 Once the couscous is ready, fluff it with a fork and pour it over the fruits and nuts; toss to thoroughly combine. Oh YUM!! I will have to try this version, looks and sounds delicious. I’d like to say that I’m using it to detox from our visit to Mom’s, but the truth is I’m still craving that Blackberry Cake and peach sangria. I love it too! Your version sounds yummy. 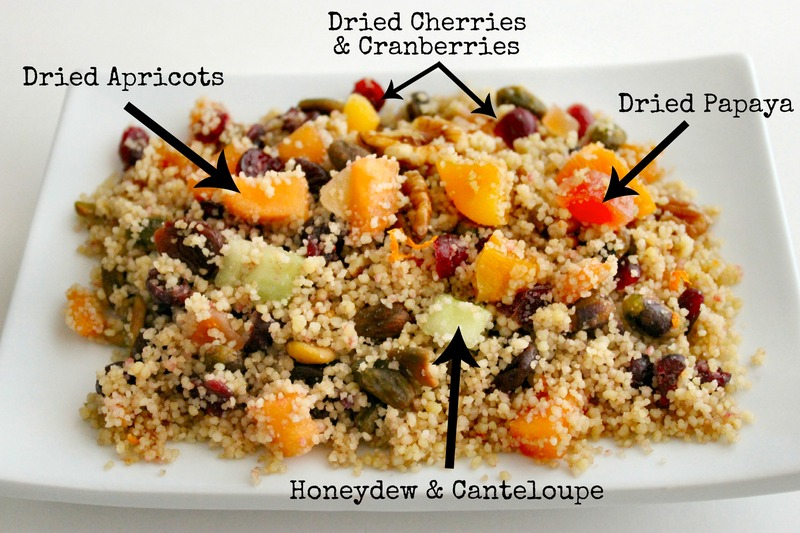 My cheater version uses canned fruit like pineapple, praches, apricots, etc… and I use the juice in place of water for cooking the couscous. Leftovers make good breakfast too. Eating it for breakfast, too. And lunch. And dinner. And dessert. I’m covering all my bases. 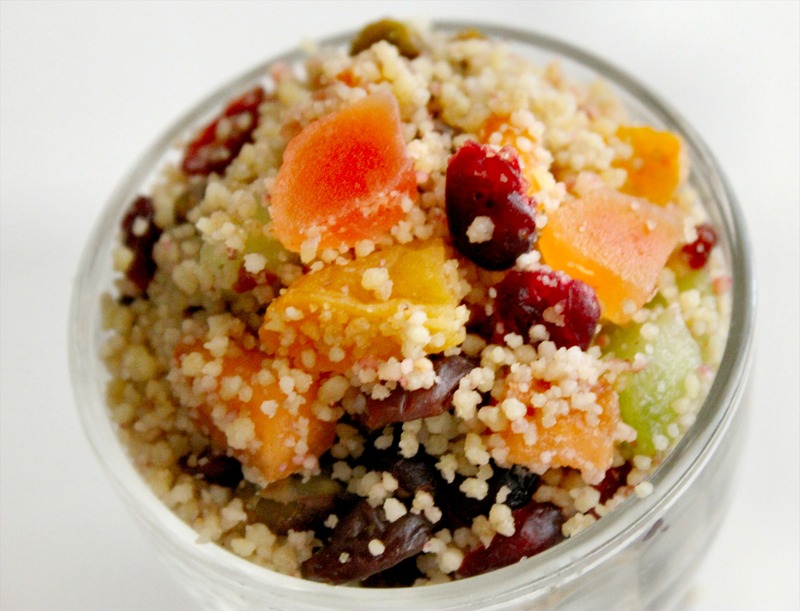 Oh lawd have mercy on your soul, because that fruity couscous looks sinfully delicious! My Northern Heart is going a pitter-pat at the mere thought of all those dried cherries. I love that you’re loving them so much. Oh, I am. I even caved and took some to my mother’s house. For real. It was a sacrifice. Next up – I’ll be experimenting with cherry buttermilk muffins. Or waffles. I’ll let you know. Thanks again for sharing them!!! You are costing me money, lady! Because as we speak, I’m wracking up a HUGE bill at the internet place for all sortsa dried things…that I can no longer live without. Because THIS and all. Hahaha… sorry, Jen! Okay, I’m not really all that sorry. I did the same thing – hit the bulk foods section of my HEB and bought a small bag of just about everything for this. It’s so good, though! And totally worth it. I am sort of new to couscous but I’m with you I love it!! your salad had my mouth watering! Thanks, Sheila! This is one of my “where have you been all my life” foods now. Can…not…stop…eating it!